The Boker Solingen T3 fixed blade was designed by knife maker Ed Martin to fulfill a number of outdoor applications from wood craft to emergency survival. This high quality, German made fixed blade comes with a robust, blasted finish, Bohler N690 stainless steel blade, Brown Linen Micarta handles and a dual-carry leather belt sheath. 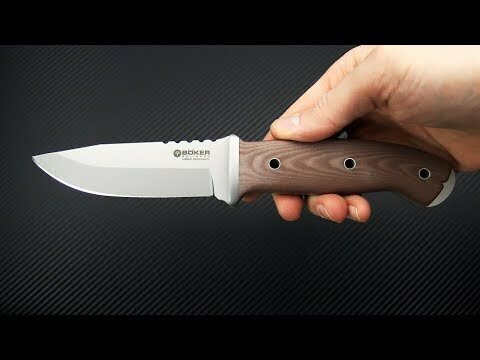 Brand new, direct from Boker Knives, Germany. Blade: The robust 4.5 mm thick, full tang blade is made from high performance N690 stainless steel with a mid-height grind for exceptional durability for heavy use. N690 offers a good balance of performance and is outfitted in a rugged, non-reflective, blasted finish. Jimping on the spine provides enhanced traction and a good platform for adding pressure to the spine for more powerful cuts. The plain edge is razor sharp and easy to maintain in the field. Handle: Three hollow stainless pins attach the fine textured brown linen Micarta handle scales to the full tang construction. A subtle dual guard is made of matching blasted stainless steel and transitions smoothly into the comfortable, ergonomic handles. The neutral handle design is comfortable in a variety of grips with downward cant at the pommel for added security. The exposed tang has a semi-hidden hole for lanyard attachment. Carries via a high quality leather belt sheath. Can be worn vertically or horizontally. Bohler N690: N690 is a high quality stainless steel with performance similar to Japanese VG-10 with high level corrosion resistance, good edge retention and ease of sharpening.